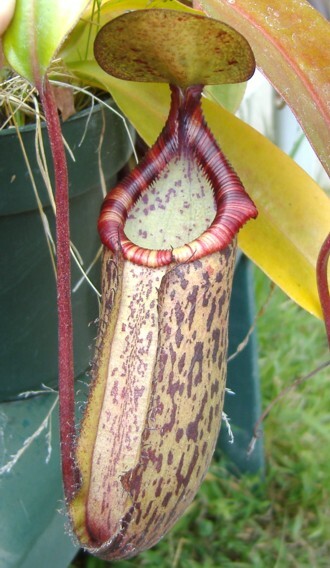 Nepenthes spectabilis X (lowii X ventricosa) is an Exotica Plants hybrid between two highlanders. Both highlander parents make fantastic hybrids. Exotica Plants often uses N. spectabilis in many of their hybrids the turn out to be quite spectacular. The other parent N. lowii X ventricosa is up there with some of the best hybrids ever produced. So I have high hopes for this hybrid to turn out well. It's been an easy growing hybrid outdoors in my highland conditions. It takes full sun and tolerates my lower winter temperatures as well. My plants are still in the juvenile stage but starting to show their potential. I think when this hybrid gets into the vining stage is where the upper pitchers will be more dramatic.